The Holy Grail is a vessel of spiritual illumination. It contains a mystery that is locked within us all. It is a secreted that is housed in our spirtual hearts. It is not an object imbued with a magical or spiritual power but it actually represents the container of the heart through which one becomes conscious of the infinite light of unity, love and of the creative potentials that lie dorment within, awaiting to be awakened. This is the heart of Christ consciousness which is why the concept of the Holy Grail is associated with the energy of Jesus Christ and the light and love within that He represents. The source connection in the heart holds yet another mystery and that is the connection to your own twin flame. 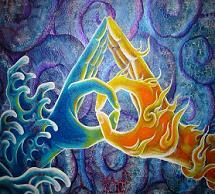 You and your twin flame are linked eternally in an intimate bond at the level of heart. Twinflames are connected through their spirit or oversoul. Your intertwined intelligences are angelic in nature and are synchronized to create a bind of love that will push you to grow psychologically and mature spiritually. The Twinflame awakens you to the truly authentic and spiritual power of unconditional love and they will unite with you fulfil an important spiritual pupose. This is a re-union that is about service to All instead of conditional or selfish egotistical love which is more focused on service to self. 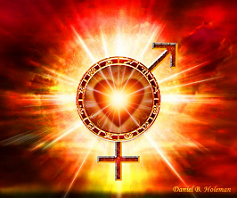 The twin flame, as your complementary energy embodies both the unique masculine and feminine qualities that will psychologically complete you on that level. The relationships acts as a mirror into your own oversoul. This can be used to eventually bring more of your hidden qualities and talents fully into conscious so that they can be integrated and made your own to be used for service work--a highly Divine calling. When the door to your own destiny open, it is the heart-to-heart connection of the twinflame energy that will draw the two of you together in Divine timing. This is your chance to fulfull the promises your souls made for this particular incarnation. When the alchemical union of the Twin Flame occurs a divine spark of is lit within the chalice of your heart and it is filled with the light of your communion. The soul-level recognition is instantaneous for some, but for others it may take a bit of time to awaken and recognize the divine connection that is happening. The quest for the Holy Grail or for your Twin Flame may be marked by dreams, revelations and guidance from those many individuals and soulmates that you will encounter on your path---your journey back to your authentic and Divine Self. Your destiny is set, your virtues are tested, and your prize awaits if you are worthy to receive it. If you are venturing on the path to finding your twinflame soulmate, there will be many tests and revelations along the way. One must be ready mentally, emotionally, and spiritually. They must be mature enough psychologically to prove their genuine love and be ready to commit for the long but worthwhile journey that awaits them with this union. With various soulmate relationships behind you you will learn what it is that makes a relationship work and what doesn't. You learn more about who you truly are. It is not unusual for a prior serious relationship to mimic some of the same dynamics that you will have to revisit with your twin flame. Also, a previous partner may hold some of the very same qualities and personality characteristics that is shared by your twin flame. Because of this, you can better appreciate those qualities in your soulmate and you will be more prepared to deal with them in the twinflame relationship. 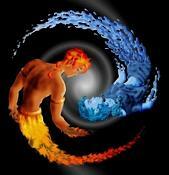 Synchronicities may be abundant prior to the meeting of the Twin Flame. Dreams are also very common on the quest for the grail. Some individuals have had dreams or visions for years, months or days just before they are about to meet their twin flame. These dreams, visions and synchronicities often reveal key clues to a twin flame soulmates identity, often pointing to some geographical location where they love or to some other hidden factor that will identify them or how the two will be united. Love, support and healing is the primary purpose of the twinflame union. In this alchemical romance, the grail, or heart's restorative and healing power is evident in the connection and commitment of the twins. On the unseen and spiritual level it is felt through the desire to heal on a soul level. Miracles are common within this union. 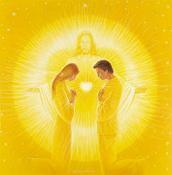 Twin flames often commune using the power of their hearts (the grail) to lend energy and healing power to one another. The Divine and Unconditional Love between them proves to be the perfect magical elixir to ease each other's pain and deep wounds on a profound and spiritual level. If you are on a quest for your divine complement you will be tested as you wait. Do not seek your twinflame externally or outside of yourself. The spiritual inner work must be done and you must realize the wholeness that already exists within you. You must awaken your own heart to the heart of your twinflame. In Divine time and by divine design your twinflame soulmate will arrive holding the mystery of the Holy Grail out to you. Through their heart you will find your own true heart and awaken to a greater and more spiritual understanding of the mysterious and spiritual connection that you both share.